Here in SWFL, it is unlikely that anyone awaits the arrival of the family’s monthly water bill with gleeful anticipation. Because you have a general idea of the cost of your regular water bill, it always comes as a shock when you open the bill one month only to find you owe an amount approaching the national debt. You’ve known you might require a bathtub faucet leak repair for your leaky bathtub faucet, but you’ve put it off, not realizing what it is costing you. An unusually high water bill generally means that you have an unexpected, undetected pipe leak or leaky faucets or fixtures. Plumbing leaks should not be ignored. A quick call to Cape Shore Plumbing and Services, Inc., your leaking copper pipe repair experts, is the first step in eliminating pipe leaks and bringing your water bill back under control. The licensed, insured and experienced team of Plumbers at Cape Shore Plumbing expertly locates the exact source and cause of all pipe leaks before attempting a complete repair. Because many pipe leaks are located outside the visible range of detection, you do not want to leave plumbing leak detection to just any handyman or home repair service. Second only to hurricanes, pipe leaks cause extensive damage to your home in a short amount of time. 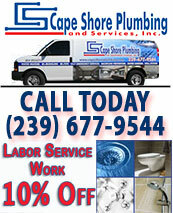 It is imperative that you call Cape Shore Plumbing’s team of professionals as soon as you suspect a leak in your pipes, faucets, or fixtures. 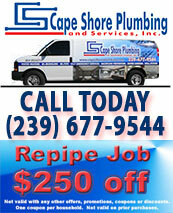 Cape Shore Plumbers, SWFL’s 24-7 response team, has pipe leak repair down to a science. No job is too big or too small for our expert technicians. 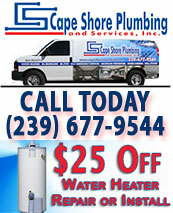 Whether you require repair of leaky faucets, drain pipe leaks, repair of copper pipe leaks, leaky bathtub faucet repair, you have a hot water heater pressure relief valve leaking, or suspect any other pipe leaks, Cape Shore Plumbing is the first call you should make. No matter what time of day or night you discover or suspect leaks do not hesitate to call Cape Shore Plumbing, at (239) 677-9544, and put an end to unnecessarily high water bills.